ANG COMD POST: 378.4 CALLSIGN - ROLLER OPS. ANG OPS: 378.4 CALLSIGN - ROLLER OPS. ANG COMD POST: 8780 CALLSIGN - ROLLER OPS. ANG OPS: 8780 CALLSIGN - ROLLER OPS. A110-1 WATERFOWL ALL QUADRANTS ALL SEASONS. CONCENTRATED NW OF RWY 16R AND E OF RWY 16L. A110-10 GLIDER/SOARING OPER 30-50 MILES SOUTH OF ARPT DURING VFR WEATHER & MOUNTAIN WAVE WIND CONDITIONS 1100 TO SS. A110-14 PURE JET TOUCH & GO LOW APPROACH & PRACTICE INSTRUMENT APPROACHES ARE PROHIBITED; ACFT OVER 12500 LBS REQUIRE PRIOR WRITTEN APPROVAL FOR TRAINING FLIGHTS; FOR FURTHER INFORMATION CTC AIRPORT OPNS 1-877-736-6359. 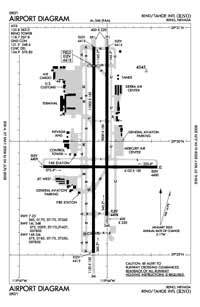 A110-15 TWY C BETWEEN TWY L AND TWY D CLSD TO AIR CARRIER ACFT. A110-16 TWY A BETWEEN NORTH TWY B AND TWY D CLSD TO ACFT WITH WINGSPAN GREATER THAN 149 FT.
A110-17 ALL COMMERCIAL AIRCRAFT CONTACT GROUND CONTROL FOR ADVISORIES PRIOR TO PUSH BACK ON THE TERMINAL RAMP. A110-19 INTENSIVE GLIDER ACTIVITY INVOF ARPT AND SURROUNDING AREAS UP TO 18000 FT.
A110-2 24 HRS PPR FOR TSNT ACFT PARKING WITH WINGSPANS GREATER THAN 75 FT.
A110-20 MILITARY: ANG OPS 1500-0100Z++ MON-FRI EXC HOL, OTHER TIMES BY NOTAM; DSN 830-4709. A110-21 TWY M CLSD TO AIR CARRIER ACFT. A110-22 TWY J EAST OF RY 16L/34R CLSD TO AIR CARRIER ACFT. A110-23 COLD TEMPERATURE RESTRICTED AIRPORT. ALTITUDE CORRECTION REQUIRED AT OR BELOW -15C. A110-3 TWY C BTN TWY L & TWY D RESTRICTED TO ACFT 100000 LBS OR LESS. A110-4 NOISE SENSITIVE AREA ALL QUADS. PILOTS OF TBJT ACFT USE RCMDD NOISE ABATEMENT PROCS; AVBL ON REQ. A110-5 NOISE NOTE CONT: PILOTS OF NON-TBJT ACFT USE BEST ABATEMENT PROCS AND SETTINGS. AVOID AS MUCH AS FEASIBLE FLYING OVER POPULATED AREAS. A110-6 MIL ACFT: TSNT ACFT EXECUTE STRAIGHT-IN FULL STOP APCH. OVERHEAD PAT NOT AUTH FOR TSNT ACFT. A110-7 MIL ACFT: NOISE ABTMT CRITICAL TERMINATE AFTERBURNER ASAP THEN CLIMB TO 6500 FT MSL ASAP. 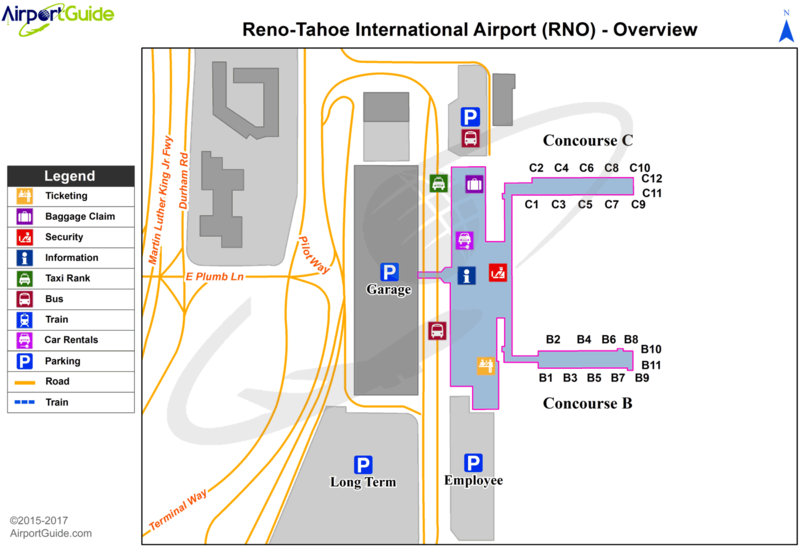 A14 PRESIDENT / CEO OF RENO-TAHOE ARPT AUTHORITY -MARILY M. MORA, EXECUTIVE VICE-PRESIDENT / COO-DEAN SCHULZ, JAIME EDROSA AIRSIDE OPNS & COMM (775) 328-6407. A43-34L PAPI NOT TO BE USED BYD 6 NM DUE TO HIGH TERRAIN. A43-34R RWY 34R PAPI UNUSBL BYD 6 DEG RIGHT OF CNTRLN. A57-34L APCH RATIO 37:1 TO DSPLCD THR. A81-APT ATC-CTL. FOR MIRL RWY 07/25 2200-0530; HIRL RWY 16L/34R & CNTRLN LGTS 0000-0530 CTC ATCT. E147 TPA 800' AGL SINGLE ENG ACFT; 1000' AGL FOR LARGER/HIGH PERFORMANCE ACFT. E80 LANDING RIGHTS AIRPORT PPR CALL (775) 784-5585; NO AFTER HRS LDG WITHOUT PRIOR ARRANGEMENT. Dual Wheel Landing Gear: 170.